If you are new to the operating room or need to learn about surgical instruments, congratulations and welcome. You’ve come to the right spot! Being scrubbed in for surgery the first time can be quite nerve wracking and even scary. Wearing a mask and sterile gown, most people feel a bit claustrophobic and are afraid of accidentally contaminating something. Don’t worry, it’s normal, everyone feels this way. There’s a lot to learn. The best way to become familiar with the surgical instruments is by holding them and getting to know them first hand. Actually go into the OR or the sterile processing department and get one of the basic instrument sets. Find a partner, either a fellow student or someone who knows the instruments already, such as a preceptor. Lay out the instruments on the back table and have one person play the role of the Scrub and the other play the part of the surgeon. The surgeon then calls for the various instruments to be passed. So for instance, when the surgeon says, “Kelly”; the scrub will find the “Kelly” clamp and pass it to the surgeon. Not only does this help you learn the name of the instrument, it’s also good practice in passing the instrument properly and immediately ready for use. So what about when you don’t have the Operating Room and Sterile Processing Department at your finger tips? 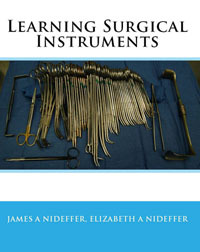 The “Surgical Instrument Guide” and the “Surgical Instrument Quiz Book” is the next best thing. The OR can be overwhelming and there is a lot to learn. But the Guide and Quiz book are specifically designed to teach you the instruments you need to know for the basic General, Orthopedic, GYN, Neurologic and Vascular surgeries you are most likely to encounter in your first months in the Operating Room. The Surgical Instrument Guide divides the instruments into their various specialties and then teaches the name, function and common nicknames of instruments to make sure you aren’t left confused when a surgeon calls for a “snap” instead of its proper name “kelly”. The Surgical Instrument Quiz book then takes the learning process one step further and gives the surgical instruments to you in a fun interactive quiz format so you’ll be ready to impress from day one in the Operating Room. Reading the passage is, exstemly encouring cause it can more then stressful. Just entering surgical dept, I’am elated an, I feel great yet afraid to make errors!!!! The site is encouraging !!!!! !